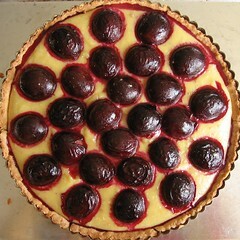 Italian Plum Tart - Do You Know The Muffin Man? Notes: The crust is pâte sucrée, the filling is pastry cream enriched with ground toasted almonds and vanilla, almond and Amaretto. The roasted plums gave off a heady aroma right out of the oven, delicious. Wonderful flaky pastry, a surprisingly smooth and creamy filling, topped with juicy, tart (but not overly so) fruit.